Introducing the most comprehensive collection of step-by-step art lessons has just arrived! Master essential painting techniques in this exciting new manual packed full of art lessons and step-by-step guidance. Discover favorite paint instruction from contemporary masters and create stunning portraits, still lifes, and landscapes from the first sketches to the final paintings with over 20 art lessons in oil and acrylic in one valuable new resource! Be the first person to tell us what you think about American Artist: Step by Step Painting Highlights and you'll save $5 on your next purchase! 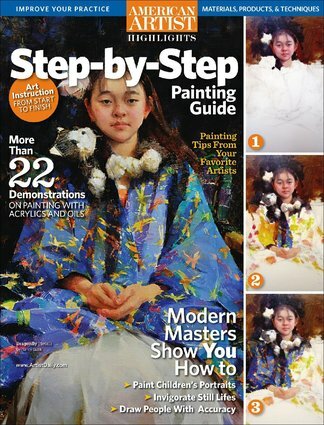 https://www.isubscribe.co.nz/american-artist-step-by-step-painting-highlights-digital-subscription.cfm 14218 American Artist: Step by Step Painting Highlights https://www.isubscribe.co.nz/images/covers/nz/541/14218/square/AmericanArtistStepbyStepPainti191694922.jpg NZD InStock /Digital/Arts & Culture/Visual Art Introducing the most comprehensive collection of step-by-step art lessons has just arrived!